The council has 6 allotment sites within Tiverton. Plots are only Available to residents of Tiverton. "So, you're thinking of having an allotment?!" 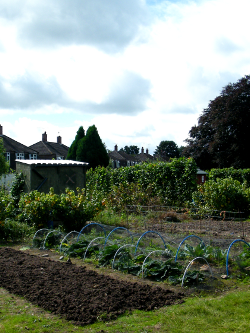 Allotments are a great source of pleasure to many people, providing fresh healthy fruit and vegetables and also a place to escape to for solitude, or for the friendly exchange of gardening ideas with other plot holders. 1. You will have a contract with your landlord, the Town Council and you should read it carefully to see what you need permission for and what basic rules there are. These rules are to protect you, your landlord, the neighbouring properties and your fellow allotment holders. If you don't stick to them, you risk losing your plot. 2. Allotments require regular work and a certain commitment of time. Plot holders usually average about 3 hours per week (minimum) spread over the year. Busy times of year are spring and late summer in particular, but there is always something that needs to be done no matter what time of year it is! 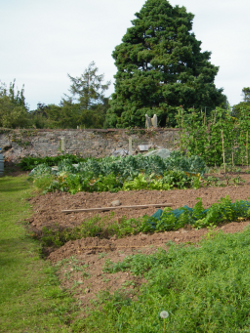 You can't 'blitz' your plot every few months – allotment gardening just doesn't work like that. 3. Make sure you are on the waiting list for the plot that is closest to your home if at all possible – the closer you are the more likely you are to go regularly! If you have mobility problems or need to have parking close by or flat access only, make this clear to the Council so they can advise you about the best site to suit you. Remember, some sites have toilets, storage areas, etc. but some do not. 4. You might want to think about having a smaller plot to begin with if you are a beginner or you aren't sure about the amount of time you can commit. Ask the Council if these smaller plots are available. You can always expand later, if there are spare plots! Remember – tell the Town Council if you no longer wish to be on the allotments waiting list or if you move home or change your phone number! Entrance to the allotment is via a gate under the beech tree across the road from the church in Redvers Way or a gateway at the corner of Beech Road and The Close. The Beech Allotment was originally moorland and care needs to be taken in maintaining adequate drainage on this site. With 50 plus allotments, this is the second largest site and has main paths laid in concrete. Entrance to the allotment is via a gate off Chapel St. The Elmore Allotment has a light loam soil. With 16 plus allotments, this is a small friendly group. Entrance to the allotment is via a lane off Harrowby Close. The Harrowby Close Allotment has a light loam soil and is our newest site. With 17 allotments, this is a small friendly group. Entrance to the allotment is via a gate off King Street. The King Street Allotment is a light loam soil. With 18 plus allotments, this is a small friendly group. Entrance to the allotment is via a gate off Park Road. The Pinnex Allotment has rather heavy soil. Entrance to the allotment is via a gate off Higher Loughbourough. The Tomswell Allotment has a heavy loam soil. With 67 allotments, this is the largest allotment site.